Upon arrival in Jogja Airport, meeting service with our friendly guide then direct to Kraton – Sultan’s Palace, Water Casttle, Bird’s market, Batik Home Industry, Kotagede – has been famous since 1930s as the centre of Jogja’s silver Lunch and dinner is provided at local restaurant. Transfer to hotel & rest of the night is free for your own leisure. Breakfast at hotel. Visit Borobudur – the most important Budha’s Monument in Indonesia. Also visit pawon and mendut temples. Lava tour visit Mount Merapi after last eruptioned. Visit Kasongan, pottery Village where the people make pottery from clay on their traditional way., Manding Village (Leather bags, shoes, belts, etc) and Malioboro (Bukit Bintang of Jogja) for shopping. Lunch and dinner is served at local restaurant. Back to hotel for overnight stay. 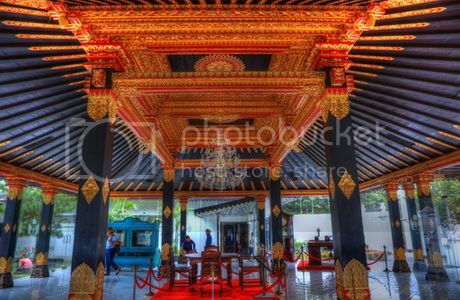 After breakfast, drive to Solo–sister city of Jogja, visit Mangkunegaran Palace and witness the fascinaty display of gold plated dance ornament, jewelries, bronze, and wooden mask collection. A short stop at Triwindu flea market, and a traditional market – Pasar Klewer. Shopping at PGS / Solo Shopping Mall. Late afternoon back to Jogja. Lunch & Dinner at local restaurant. Transfer to hotel. Breakfast at hotel. Fullday excursion to Dieng Plateau on the altitude of over than 2000 m above sea level – fantastic panorama all the way long, passing by between SUMBING and SINDORO MOUNTAIN, visits to oldest Hindu temples, actives craters and the beautiful lakes. Late afternoon back to Jogja. Lunch and dinner is provided at local restaurant. Overnight at hotel. Breakfast at hotel. Transfer service to the airport of Yogyakarta for departure. Arrival Jogja, meet and greet by our friendly Guide, then direct going to Borobudur golf, for play Golf. Lunch at local restaurant, visit Borobudur Temple then back to Jogja and direct check in hotel. Free program. Dinner at local restaurant. After dinner transfer to hotel. Breakfast at Hotel then going to Merapi Golf, lunch at local restaurant. Tour visit Prambanan temple, silver factory, malioboro street, dinner at local restaurant. Back to Hotel for overnight stay. Breakfast at Hotel. Transfer to Jogja Airport. Arrive at the Airport, meeting service thence direct Jogja city tour by visiting Sultan’s palace, Tamansari Water Castle, Bird’s market, Batik home industry and Silversmith at Old Town Kota Gede. Lunch and dinner at local restaurant. After dinner transfer to Hotel for overnight stay. After breakfast at Hotel, visit LAVA – from last eruptioned of Mount Merapi with its fired plantation and everything with more than 1000 centigrade. Afternoon visit Borobudur – the most important Budha’s temple in Indonesia. Return to Yogyakarta enroute stop at the Agro Toursm Village to see Salak Pondoh. Then last minutes shopping at Malioboro. Transfer to Hotel. Lunch & Dinner at local restaurant.